p4wifi (GT-P7510): WIFI only tablet. p4 (GT-P7500): Cellular / 3G tablet. [I]p4wifi and p4 users do NOT install this. 37bb785 FUSE: Notifying the kernel of deletion. d5c6ade Revert "fuse: Add support for shortcircuited read/write for files"
d21014b Revert "Revert "wifi: Set the mode at native layer""
e06eb06 sdcard: Add support for sdcardfs! TRIM is now merged into this ROM. You don't need to install the TRIM kernel from the other thread. cf415a5 misc: uidstat: avoid create_stat() race and blockage. 5565950 Revert "Staging: android: binder: Allow using highmem for binder buffers"
2477c3b Revert "net: wireless: Sync with grouper android-5.1.0_r0.4"
9a40b65 mmc: host: sdhci: abort suspend if host suspend fails. 20c3c84 Revert "Optimize double/float immediate loading on arm." 111a9b9 Revert "mediaplayer: remove use-awesomeplayer developer option"
a998f78 Revert "Revert "video: tegra: remove free memory check""
98144ac Revert "developer settings: remove "Use deprecated AwesomePlayer" settings"
868ba34 Revert "bound cpu cores to same speed"
Can I upgrade / dirty-flash from Lollipop to Marshmallow? - You cannot. It must be a clean install. Can I dirty flash over a previous Marshmallow build? I thought you said Marshmallow wouldn't work. - The problem with ART is not solved. The Optimizing compiler backend is producing binaries that crash on the Tegra 2. 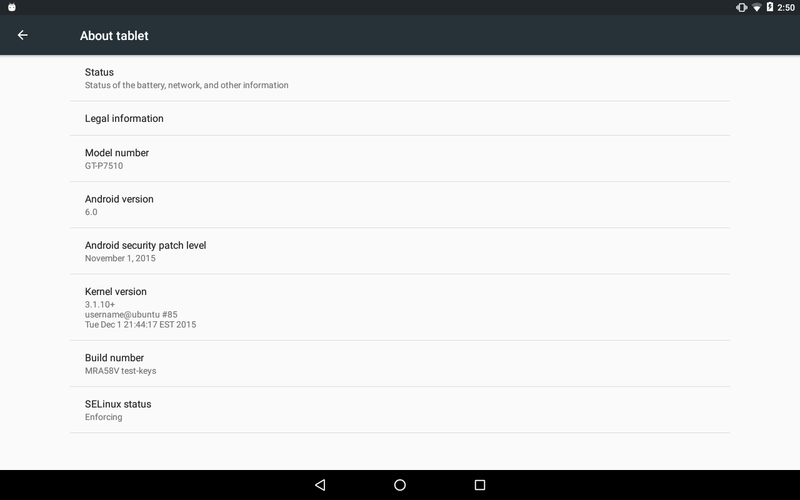 The Optimizing backend is the new default dex2oat compiler in Marshmallow. The Quick compiler is default backend in Lollipop. It is still in the Marshmallow source so this ROM is using the Quick compiler backend. - The default SELinux mode is permissive mode. The Set_SELinux_enforcing.zip will not work with Marshmallow. That script was setting a system property to toggle SELinux early on in boot. Google has removed the use of this system prop so that method won't work anymore. - For now you can find some app on F-Droid to set the SELinux mode after boot. It's not ideal but it will do until some better solution arises. - This device does not meet the hardware requirement to support Doze. - Marshmallow supports RRO (Layers) themes. I will not add CM-12 themes, CM-13 themes, or any other theme engine. HD video playback issues and Camera issues. - The video and camera stack are proprietary NVidia software. This means there is no chance of fixing bugs within. - Google App now uses the NEON instruction set which the CPU on this device does not support. The pico package does not include the parts of GApps which use the NEON instruction set. Got an error? Is something not working for you? I cannot see what your problem is from here. Save and upload the system logs from your device so that I can see what happening on your device. Root the device by installing SuperSU. Open Syslog app and save the Kernel Log and Main Log. Send me the log files stored in /sdcard/Syslog. Share the files on Dropbox or another similar site. Then PM me a link to the files. Please describe exactly what the issue is. Some comments to start off. The ICS audio HAL is not working right in Marshmallow and I think I'd rather try another run at getting the rest of the stuff in the open souce HAL working rather than keep trying to find hacks to keep the old blob alive. Recall that only voice calls and dock audio are not working with the open source audio HAL. - Voice calls are just passing off audio to the Samsung cellular blobs so I don't think it's that much of a stretch to get working. But this will have to wait until cellular stuff is working in the first place. - I found some patch for Samsung dock audio. It looks like it might apply to this device as well seeing as it seems to have a similar dock implementation. The patch is in the ROM already so that needs testing. Cellular probably won't work for at least the first few builds. Other devices on M with a similar cellular radio needed a few new patches to get it working on M. I have put in the patches from L but we will have to trial and error what is needed for M based on other devices as a reference. I know it's early on, but do you have any expectations as to how well it will run compared to previous Android version? I appreciate all you've done, but mine never ran that great on the newest roms. It is passable and I appreciate it though. The OS appears to perform the same as Lollipop. It's a four year old device. There is nothing that will make it run as well as a modern Android device. You could try setting animation times to zero and set ro.config.low_ram=true. For Marshmallow I have added L2 cache improvements in the kernel that improves RAM speed benchmarks. That's around 1k score in Antutu. I understand that. And again I appreciate it. I was just curious what the performance level was. I expected at best it might be similar, but more likely it would, as is typical, use more resources. I never expected much from my Tab. Finding your ROM was an unexpected surprise. I will try those tweaks. From all of the posts I read, I got the impression that many other tablets ran better than mine. I know fully well that each tablet is different and I don't blame you or the ROM, just my tablet. Definitely wasn't expecting this tbh. You're doing a damn great job at keeping this tab alive decatf. Thank you for that. Now the P4 is stuck at the Samsung boot logo, so it does not boot up.